Tony Stark plans retirement as Iron Man just as he introduces free energy to the world. 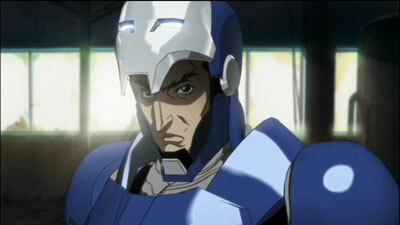 Plans change when Zodiac tries to sabotage Stark’s new Arc Reactor in Japan. 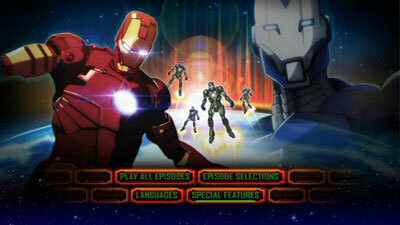 When Marvel and Madhouse made their deal to co-produce four series for the Japanese market (and later the American and worldwide markets), four properties were chosen. No doubt some consideration had to have been made to pick properties that were popular or at least recognizable in Japan, or that would otherwise translate well to the anime sensibility. Of the four properties chosen, Iron Man may have arguably been the safest bet. With two popular features in the recent past, the marketability of the character has certainly never been greater. 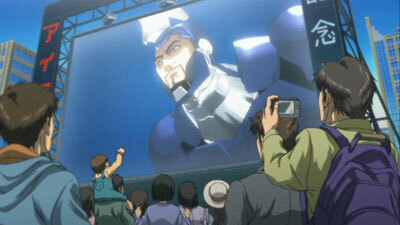 And… nothing says anime like men piloting fighting robots, which isn’t all that far removed from the Iron Man concept. 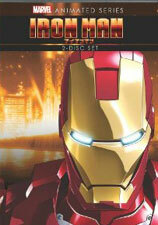 It seemed like a natural, and so Iron Man was chosen as the lead series, debuting in Japan in late 2010. 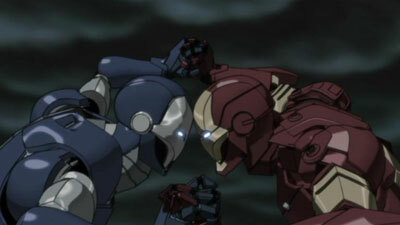 The Iron Man in the Iron Man anime fits comfortably in the movie continuity. Tony Stark, the world-famous billionaire and superhero, comes to Japan to oversee the opening of his Arc Reactor, which will provide unlimited free energy. It is Stark’s plan that clean, free energy will help to lead to world peace by solving the source of mankind’s greatest conflict. (His premise is up for debate, but this is what he hopes.) In addition, Stark announces plans to retire as Iron Man even as he is about to produce a series of new armor he calls Iron Man Dio, which will be tested initially by three Japanese pilots. The Japanese people are not entirely convinced that the reactor is safe or that its operation is in Japan’s best interest, but Stark has the cooperation of Japan’s Self-Defence Forces and Minister of Defence Kuroda. There is also a particularly hostile group known as Zodiac that wishes to interfere with Stark’s plans. 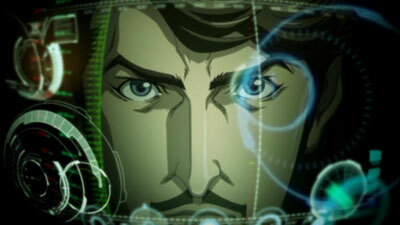 Over twelve episodes, Zodiac tries repeatedly to attack Stark and/or sabotage the reactor. 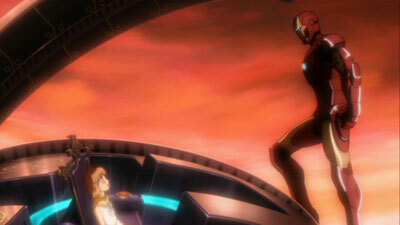 They begin by interfering with the Dio test flights, and they utilize their agent Scorpio to eventually steal the Iron Man Dio armor, which is later piloted by a member of Zodiac with ties to Iron Man. Subsequently, Zodiac steals a plutonium shipment and Stark is accused of trying to smuggle plutonium into the country. 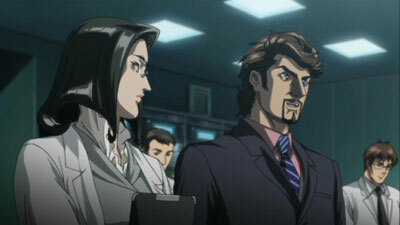 Stark fights Zodiac’s Cancer robot, and with the help of reporter Nanami Ota clears his name, but not without getting into conflict with the SDF’s Captain Sakurai. 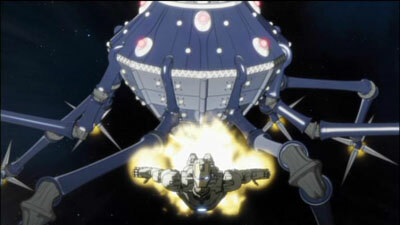 From there on, the plots generally involve Zodiac’s efforts to disrupt Stark’s plans, using a succession of zodiac-inspired mechas. That in itself would get boring, but there is more going on than just metal warfare, as we follow Tony’s budding relationship with his project manager Dr. Chika Tanaka, the threatening reappearance of someone that Tony thought was long dead, and the developing respect and camaraderie between Tony and Captain Sakurai. 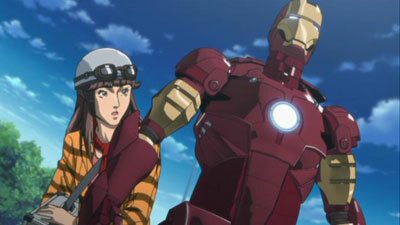 Sakurai also becomes an Iron Man of sorts, as he pilots the SDF’s own Ramon Zero battle suit. A few episodes do stand alone better than others, such as when Iron Man goes up against a scientist who can create tornadoes, or when Zodiac contracts a race car driver to kill Tony (an episode in which Wolverine appears); but generally there is a long-form story being told here. Every episode serves to push the narrative forward, building up to the final showdown between Iron Man and Zodiac, as all the mysteries are revealed. The face of Zodiac’s leader isn’t too surprising in the end, but it’s more about the voyage getting there, a voyage that includes stunning fight scenes and cutting-edge animation. While the animation is hand-drawn for the most part, the use of CGI for the combatants is seamless, giving the show a sophisticated look that seems traditional but at the same time delivers a great depiction of the various metal suits. The writing and direction are quite good, with the stakes always feeling real. Tony does seem truly endangered much of the time, as do the innocents caught in the crossfire, such as when Zodiac creates an environment of radiation poisoning to discredit Stark. 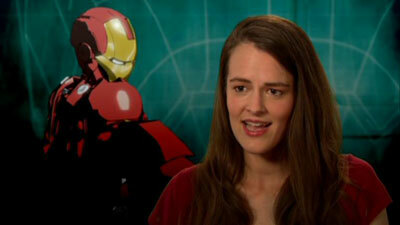 And not all of Tony’s allies are safe, either. The one thing the series struggles with is having so many faceless adversaries for Tony to face, but that’s the chance you take with the mecha genre. Anyways, his true opponents are the men he comes into conflict with, and those interactions are portrayed well. And Tony himself is shown to be a complex individual attempting to overcome his past in order to bring a better future for the world. He is portrayed in the English dub by Heroes’ Adrian Pasdar, who brings humanity to Tony while still making the superheroics believable— it’s really a very good performance. Aside from taking Stark out of his normal environment, and having only brief appearances by friend and associate Pepper Potts, this anime feels true to Iron Man. It definitely looks like anime, though, so if that’s not your thing, you may hesitate; but then you’d be missing out on a pretty nifty Iron Man adventure. The Marvel Anime Universe: Re-Imagining Iron Man (9:44) has Marvel executives like Jeph Loeb, Cort Lane, and Megan Thomas Bradner, as well as story writer Warren Ellis, discuss how Madhouse made the translation of Iron Man to anime and a Japanese environment. They emphasize how much freedom that Madhouse was given, and how satisfying the results are. Voicing Tony Stark: Interview With Keiji Fujiwara (5:12) introduces us to the actor who played Tony in the Japanese audio track. Maybe it’s just the translation, but he comes off like a vacuous actor who spends a lot of time saying very little. Hopefully he comes off better if you speak Japanese. 21st Century Hero: The Technology Of Iron Man (7:28) simply has the Marvel folks geeking out over all of Iron Man’s cool tech, but it is interesting how they (particularly Ellis, a known science geek) point out the true cutting edge tech that gets touched on in the story. This one is mostly skippable, however. 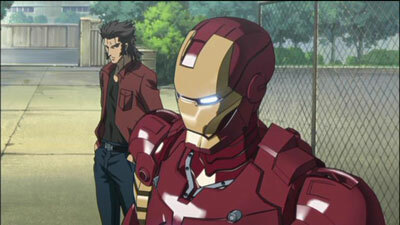 Special Cross-Talk: Marvel Anime’s Iron Man And Wolverine (28:48) is by far the best special feature in this set, with in-depth discussion of the series by the Japanese production crew. Yes, it’s subtitled, but don’t be discouraged. If you want to see behind-the-scenes footage, pre-production artwork, and creative analysis, this is the one you have to watch. A set of Previews also appears on the second disc, including those for Attack of The Show, Moneyball, Starship Troopers: Invasion, Resident Evil: Damnation, an anime film whose name is strangely never revealed, and Sky Crawlers. The two discs are packed in a keepcase, with a disc held on either side. An insert advertises the TV show Attack Of The Show. No episode listing is provided. The 1.85:1 image is very pleasing, and due to its likely digital-to-digital nature, you won’t find any dust or other debris to spoil things. The picture does exhibit a lot of softness at times, though that’s largely because of the style being used. When the director chose to leave things sharp, there’s good clarity, but the detailing of the various mecha does get lost a bit in standard definition. A Blu-ray upgrade would have been preferable. The discs default to the Japanese Dolby Digital 5.1 track, and whether listening to that one or the English Dolby Digital 5.1 track, you are in for a treat. The pulsing soundtrack, continuous mechanized sounds, explosions, and ambient sound effects all come through wonderfully, and make excellent use of all speakers. English subtitles are available in either regular or “for the hearing impaired” versions. 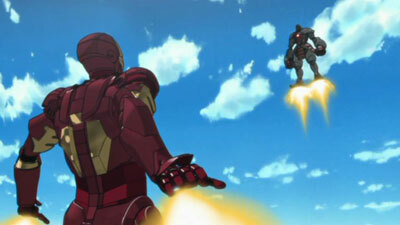 I know that some people simply do not like the look and feel of anime, but it’s hard to imagine an Iron Man fan not being at least a little impressed with this fast-moving, battle-filled story that still manages to humanize Tony Stark just about as well as the films. At times I felt a little un-involved from all the mecha battles, but in truth that is only a small part of the stories. There are actually far more dialog than fight scenes, and we get to see much more of Tony than Iron Man. Overall, it’s a good balance between action and story, with dynamic animation when it counts.